It sounds like a difficult book–it’s interesting that you found it such a gripping and fast read. I ordered Saramago’s memoir from Net Galleys, but turns out that it’s in pdf format, which I find not easily readable on the kobo because if the print size is comfortable for me, I have to scroll back and forth. I looked at this on NetGalley because I knew you were reading it, but decided not to ask for a copy as I’ve never read any of her fiction and thought there might be references I wouldn’t understand. However, from what you say that probably isn’t the case. Thank you for this. I think I’ll go back and put in a request. While it obviously wasn’t the most comfortable of reads I work with a lot of people in similar situations and anything that helps me to empathise would be a good thing for me to get hold of. How interesting! This is a book I will add to Joan Didion’s Year of Magical Thinking, as one to recommend when people are in moments of extremis, and anything jolly and insensitive simply will not do. I think I might spend the whole reading time fearing for Mister Litlove’s health and berating him for going out without his coat on, etc, and imagining myself a stricken widow. So, a book best left for sunnier months for me! But I do like JCO, and my experience with her novels is that she writes queasy, disquieting stories that nevertheless hook you. Like Litlove, I was reminded of Joan Didion’s Year of Magical Thinking when I read your review. What irritated me about that book was that Didion never seems to have realized that people all around her have been widowed for generations. It was like she thought she was the first person ever to have experienced loss, and oh my, wasn’t she in special pain. It sounds like Oates had a similar discovery? I like JCO and I sort of like that uneasy feeling you get reading her work, but she’s not someone I can read a lot of–at least close together. Like Litlove and Bardiac this reminds me of Joan Didion’s memoir. I’m not sure the JCO is one I could read as I found the Didion stressful–it’s not easy to read about illness and death of a loved one. I’m not surprised, though, to hear you found this gripping all the way through! I’ve only read her fiction, actually is this her first non-fiction? I can imagine how intense this book must be. I’m just constantly amazed at how many books the woman writes. I am intrigued but I think it’s one I’d have to be sort of prepared for. Real grief is just hard to read about. I’d like to read this. I enjoyed Joan Didion’s Year of Magical Thinking and this sounds like it is in the same category. I would argue also that Oates is a more emotional writer than Didion, so that must make this feel different. Have you read the Didion? Would you be able to compare the two? Both your analysis of this book and the commenters’ comparisons to Didion are interesting to me. Personally I tend to relate much more to Didion’s style, but not having read either of their memoirs of widowhood I wonder if that would hold for such a departure from the novelistic style (even though I’ve mostly read Didion’s essays rather than her novels). Like Litlove, I imagine that reading either one would bring out my mother-hen, imagining-myself-bereaved tendencies. I’ve been kind of saving Year of Magical Thinking for the day (hopefully far in the future) when I may have need of it. Wonderful review – I wasn’t aware this book existed. I did read Didion’s year of Magical Thinking and found it a wonderful book that transcends the “grief memoir” – I have long struggled with Oates – loving some of her work and loathing some of her work – but this review makes me want to tackle this particular book! Lilian — that’s too bad about the PDF format. I tried to read PDFs on my iPhone, but it won’t work. The font is barely readable, and if I enlarge, it’s incredibly awkward to read. It’s good to know that about the Kobo. Annie — you definitely don’t have to know anything about Oates’s fiction to appreciate the book. I think it would be great to help understand and empathize with other people’s grief. I’d be very curious to hear what you thought of the book. Litlove — I’m not familiar with Oates’s fiction, but it’s interesting to see links between it and this memoir. I wonder if she used similar techniques in both. Interesting! I’m also curious about whether someone who is grieving would want to read this or not. I’m not sure if it would make things worse or better. But it does sound good to have a list of books about grieving for when people want them. Bardiac — I haven’t read the Didion book (although I have it to read), but it sounds like maybe Oates was a little better at recognizing she’s hardly alone in this. She talks about having realized she’s now a part of a large group of people whose lives have basically been hollowed out (how she puts it). I can see that not recognizing that would be irritating. Danielle — if you found the Didion book stressful to read, my guess is you will think this one is as well, and I can certainly see not wanting to put yourself through that! I’ve only read one Oates short story, and it’s an old one, so maybe I should read more of her stuff! Teresa — I wonder how the two compare. I thought about reading the Didion next, but that seemed like a little too much all at once. The issue of detachment is interesting, because Oates switches back and forth between detachment and raw emotion. The switching back and forth works really well. Iliana — I don’t think this is her first nonfiction, although I’m not entirely sure. She is very prolific, and she talks a little bit about the people who criticize or make fun of her for writing so much. She doesn’t talk about how it is to write so much, though, which would be interesting. Michelle — I have the Didion on my shelves, but I haven’t gotten to it yet. I should read it soon to compare, I suppose, although I don’t know when that will happen! It make sense to me that Oates is a more emotional writer, but I’m not really familiar with any of her other work, so I shouldn’t really say. Emily — of the two writers, I’ve only read Didion’s essays and one Oates story, so I can’t do much comparing. My guess is that Didion’s style would generally appeal to me more as well, but I’m not sure, really. It’s an interesting idea that while experiencing grief, reading about someone else’s experience might be comforting. It’s certainly a good idea to have these books around if that is true! BuriedInPrint — I have that book on my shelves, and am very curious about it. I like that it added books to your TBR pile as well! Everythinginbetween — it’s coming out in the next month or so, I think. Maybe in February. Interesting that you’ve been back and forth about Oates. I haven’t gotten to her fiction, but I’m curious. I’m glad to hear you liked the Didion book so much! This sounds interesting an sad and intense. I haven’t read Didion’s memoir but your description of JCO’s made me think of it. Should I manage to get a seat in the first come, first served small auditorium where she will be speaking here in March I will be curious to see if she talks at all about her motivations for writing the memoir especially given that final quote. Interesting review! I also have Didion’s memoir on my shelves but am a bit wary about it (it never seems to be the right time). So I’m very curious to hear (one day) your comparison between the two. I read a long excerpt of JCO memoir in a magazine somewhere (can’t point where), and I was relieved that her voice sounded a lot more empathic than her fiction, which I have grown a bit afraid of I must say. I really enjoyed this review, especially the fact that it is a memoir and that it is repetitive but still enjoyable. It should be a good read, someone actually writing their day to day moments during the death of a loved one and the very lonely time following. It would possibly give other widows the opportunity to realize that they are not alone. I enjoy a quick read and if someone were reading this was a widow, the repetitiveness would be a plus, because they would not be able to stay focused and reading it would maybe even feel like an accomplishment for them. I am not sure if I would read this but would absolutely recommend it to someone in need. 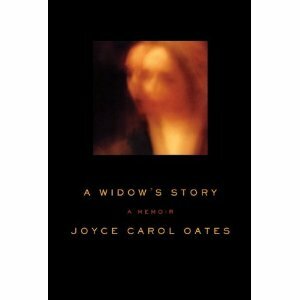 Joyce Carol Oates, if ever brave, was so at the start of her career. Now, long since the lost days, Oates has authored what I currently consider a vanity. This memoir, or any reflective musings, are best practiced and penned by anyone other than a writer. It adds nothing to a life lived reading subjective plodding texts, inclusive of every cankering slight, life shift, the unfortunate death of a spouse or a sudden awareness that the entire populated earth has experienced. Leave the author to her niche, though indeed unrecognized by the larger awards, her short stories and the dentist to his legitimately earned memoir.